From My Easel By Carmen Cilliers: Tjiqi-Tjiqi an Idylic Paradise. "Welcome to Tjiqi-Tjiqi! A far away land made up of hundreds of gorgeous islands where the islanders laugh and smile! Where the sun shines, and water is fresh and abundant! The fruit is sweet, the animals and birds are one with the islanders... these islands are ... idyllic, pure & perfect in every way!" This shoal of islands, including their mainland are known as "Tjiqi-Tjiqi" (pronounced 'cheeky-cheeky') and have slowly been evolving in my mind for some time. 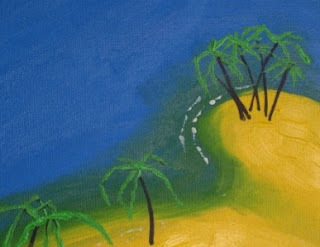 In the first few paintings you will "sail" around and discover some of these islands. Some seem deserted, some not. You will meet amazing islanders, see amazing animals and plants. Beware, this island is hard to leave, but it's also hard to find. Get your passport ready... it's time to go on a "matjiqal" (magical) journey! This painting is titled "Luvas Cove". It is a remote little island in Tjiqi-Tjiqi, used mainly by the island couples for special times alone. When painting, I kept shapes and colours simple and honest to symbolise the beauty, innocence and purity of this little place for lovers. The painting is painted with acrylic on canvas, including all sides and measures 40cm(h) x 50cm(w). Love the island series! I'd love to go to YJIQI_TJIQI! Your work is very fun!